Jessica Scott of Hopkinton ttok state honors in the long jump and the 55-meter dash. Scott won the state title in both the 55m dash and the long jump, where she set the record for the best jump in Massachusetts this indoor season (18-2.5). She also won both events at the State Coaches and Division 3 meets. She’ll attend Northeastern. Notre Dame (H) won the All-State title led by Dimare, who won the 55 hurdles title in 8.32. She also won the Division 3 title in 8.62 as the Cougars finished third. She was also a part of the 4x200 team that finished second at New Englands. The senior capped off a brilliant winter by winning the national championship in New York City, clearing 5-10.5. She also won at All-States and the Division 2 championships, where she cleared 5-8 both times. Her title helped Marshfield finish fourth in Division 2. Irvin set a All-State meet record in the 300 meters with her winning time of 39.04. But her best time was in the New Englands, where she won in 38.67. The junior honor roll student is ranked number five in the country for the 300. Mcnulty finished her last high school indoor track season with a 4:55.25 mile that led her to first place at the All-State meet. McNulty also clocked in a 11:02.53 two-mile at the same meet, placing second and helping Bishop Feehan finish as runners up. Piccolo is one of the fastest in the country at her speciality, the 600. A repeat All-Scholastic, Piccolo’s consistency led her to win All-States in the 600 (1:34.81) and the Division 5 titles in the 300m and the 600m for the second consecutive year. Only a sophomore, the former Division 1 cross-country champion took first place in both the mile and 2-mile at the Division 1 championships. She also won the 2-mile at All-States in 10:59.97 and was the runner up in the mile at the New England Championships (4:56.81). No one came close to beating Shepard, who took the All-State title in the 1000 at 2:48.70, nearly five seconds ahead of the pack. She was also the State Coaches and Division 3 champion and a member of the 4x800 relay team that won states. Smith continued her legacy as a shot put champion, winning titles at the State Coaches, Division 1, All-State, and New England meets. This comes after winning the New England outdoor title last spring. The Bay State Conference All-Star is also an honor roll student. After finishing eighth at All-States last year, Sullivan improved this winter, winning the Division 2 long jump title (17-5.50). 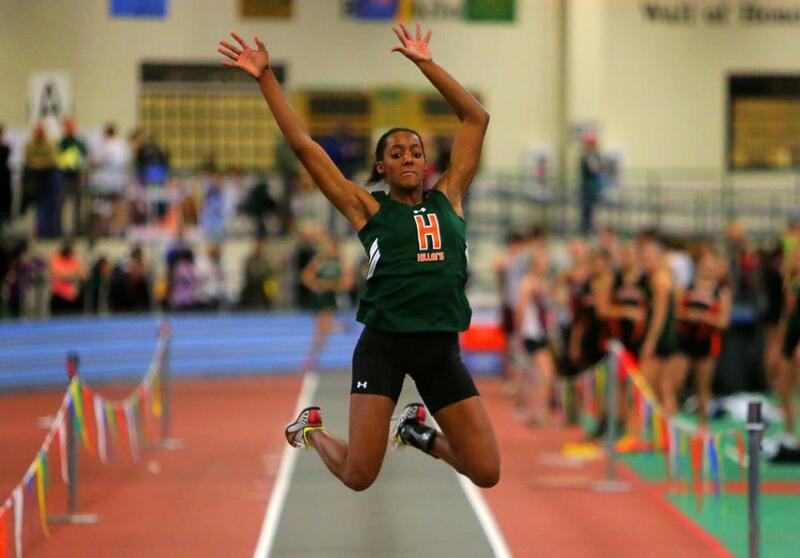 She took second at the All-States (18-1.50) and then won the New England title. She also earned All-American honors in the pentathlon. The 4x200 crew of Kenlee Presume, Esmeralda Asprilla, Maya Halprin-Adams, Sydney Fisher, and Jordan Poindexter finished the season strong, helping their team take first place in the Division 1 championships after winning their event. They continued their successes into the All-State meet, where they took the title (1:44.07) before coming in third at the New England Championships. The foursome comprised of Maddie Oldow (sr.), Rachel Stier (so. ), Lindsay Goulet (jr.) and Mikaila Amerantes (jr.) broke a school record for the second year in a row in the 4x400 relay after winning All-States in 3:58.65. They also took the title in the Division 2 championships as well as the State Coaches meet. The Dracut squad of Kaylee Shepard, Karina Shepard, Rachel Flores, and Katie Colfer came out on top in a competitive group of 4x800 relay teams, winning the All-State meet (9:26.19) and finishing as champions of the Merrimack Valley Conference. The team also won the State Coaches title, was second in the Division 2 relays, and placed fifth at the New Englands. In his ninth year coaching, Patterson led Lowell to one of its most successful winter seasons in school history. Lowell went 4-0-1 and was the MVC dual meet co-champions. Lowell also won the MVC meet and finished third in the Division 1 state relays. In his eighth year coaching, Van Cott led Needham to 11 school records this season, as well as the state’s fastest 4 x 800 relay (9:22.91). His record is 3-2-1 in the Bay State Conference, and Needham finished third at the Division 2 meet. While it was Diedricksen’s sixth year at Hingham, it was her first year as head coach. Hingham won the Division 3 Relays and took place second in the Division 3 meet. Diedricksen is also a former triple jumper in high school and college in Canada. Whether it’s cross-country, indoor, or outdoor track, Pembroke is always in the mix and this winter the girls track team won the Division 4 relays and Division 4. Rooney has been at Pembroke five years and in that time has won five divisional titles. In Swanson’s first year at the Dedham school, Ursuline won the Division 5 title and finished third in the Division 5 state relays. The Brockton High and Bentley graduate was previously head coach at Dover-Sherborn. He also coaches outdoor track. Atlantic Coast — Brockton: Celina Andrade, Azariah Boyd, Celina Canuto, Danika Clarke, Talia Halliday, Patricia Mulinge, Sarah Remy, Sade Rivera, Nikayla Simpson. Dennis-Yarmouth: Tori O’Dea, Madison Pawlina, Kayala Ralston, Alexis Whatley. Falmouth: Lily Joseph, Lauren O’Neil. Marshfield: Ellen DiPietro, Kate Spitler, Kelsey Sullivan. Norwell: Sarah DiGregorio, Danielle Griffin. Nauset: Coralea Geraniotis. Plymouth North: Jordan Callahan, Sophie Gorton, Jacklyn Sullivan. Plymouth South: Jayci Andrews, Holly Sessler, Maddie Sessler. Sandwich: Tory Sivco. Bay State — Brookline: Anya Gorodentsev. Milton: Andrianna Higgins. Natick: Mariel Boggia, Kisha Kalra, Kayley McGonagle. Needham: Sarah Armstrong, Margie Cullen, Kaleigh Hughes. Newton North: Christina Galvagno, Maeve Greeley, Annie Greene, Elizabeth Koch, Michaela Smith. Walpole: Gina Conti, Allie Morris. Wellesley: Ally Isley, Tatiana Jarostchuk, Grace Rademacher, Emily Ryan. Weymouth: Ashley Betts, Meagan Deane, Kacie Higgins, Kelly Higgins, Kristin Leone. Big Three — Durfee: Courtney Cabral, Megan Rockett, Allison Stasz. New Bedford: Dayva Briand, Lisa Chan, Raybryana Dasher, Damani Nascimento, Laura Vieira. Boston City — Latin Academy: Kelly Dao, Britney Firmin, Ashley Lewis, Leigha Mills. New Mission: Laneece Byrd, Natalia Phillip. O’Bryant: Juleen Lewis. Snowden: Maria Lewis. West Roxbury: Hirmine Francois. Cape Ann — Ipswich: Jill Calvani, Emily DeMarco, Michaela Hedderman. Manchester Essex: Fiona Davis, Olivia Lantz. Masconomet: Kayleigh White. North Reading: Cole Godzinski, Emily Murray. Triton: Kerstin Darsney. Dual County — Acton-Boxborough: Sophie Antonioli, Suzanne Cotter, Morgan Doan, Brianna Faubert, Katrina Gerhard, Emileigh Glode, Abby Taussig. Bedford: Elliana Boebel, Danae Bucci. Boston Latin: Allish O’Brien, Mia Sheets, Ava Violich. Concord-Carlisle: Julia Gregory, Meaghan Teitelman. Lincoln-Sudbury: Lucy Alexander, Alexa Babick, Morgane Butler, Sydney Clary, Ariel Keklak, Kristin Kimble. Newton South: Lucrecia Aguilar, Rebecca Grusby, Charlotte Huth, Clare Martin, Lizzie Walkes. Notre Dame (Hingham): Liz Baker, Elizabeth Constantino, Mary Claire Dachille, Isabella Dimare, Taylor Kennedy, Gabriela Kenyon, Julia Marshall, Amanda Reilly, Gabby Sillari, Katie Steeves, Elizabeth Tevnan. Waltham: Noemi Guevara, Katie Meahl, Jenny Sexton. Wayland: Sheryl Chin. Westford: Kate McCluskey, Rachel Vining. Weston: Fini Bichara, Jillian Howard, Samantha Thompson. Eastern Athletic — Bishop Feehan: Sara Amato, Jackie Cutillo, Elizabeth Hannon, Brynna Harum, Abigail McNulty, Riley Scharland, Teresa Yoder. Bishop Stang: Theresa Gallagher, Elizabeth Sullivan. Coyle & Cassidy: Krista Fernandes. East Bridgewater: Maggie Lydon. Mashpee: Jackie Lynch. Somerset Berkley: Cassie Graca, Hailey Monaghan. West Bridgewater: Emily Quinn. Greater Boston — Cambridge: Esmerelda Asprilla, Sydney Fisher, Maya Halprin-Adams, Jordan Poindexter, Kenlee Presume. Malden: Carly Amos, Carine Exume, Victoria Hannafin, Joviana Morin, Taymise Sanders, Ariela Schear, Anne Woolley. Medford: Cassie Greene, Sara Volmar. Somerville: Kaba Alison, Saragrace Marge, Catherine Nakato, Melissa Sanon. Hockomock — Foxborough: Meredith Cronin, Liz Holmes, Kayla Sepe, Hayley Sykes. Franklin: Erin Hanley. King Philip: Andrea Olson, Renee Poirier, Abby Seaberg, Olivia Weir. Mansfield: Mikaila Amerantes, Sami Carey, Jacqueline Dickman, Kelsey Ferreira, Caitlin Finnerty, Lindsay Goulet, Marissa Horn, Maddie Oldow, Sabrina Pray, Rachel Stier, Lauren Waters. Milford: Keilan Nova. North Attleborough: Hana Caster, Katheryn Loughnane. Oliver Ames: Olivia Mileika. Sharon: Rita Kushner. Middlesex — Arlington: Megan Lo. Belmont: Rachel Berets, Julia Cella, Julia Lenef. Burlington: Alex Demeo, Shauntel Farland, Kaitlyn Gilberg, Erin Hardy, Michelle Lytje, Rebecca Salina. Lexington: Hanna Born, Paige Campbell, Alex Cox, Jessie Foley, Emma Houston, Lucy Lang, Paige Lawlor, Grace Leightheiser, Olivia Manickas-Hill, Becca Pion, Melissa Solomon, Jakiya Taylor. Melrose: Ashley King, Maddie Oro. Reading: Abby Allardi, Leah Angelini, Sarah Bond, Russ Stevens. Stoneham: Meredith Coccoluto, Alize Galy, Emily Manfra, Lauren Olton. Wakefield: Deidre Beck, Sarah Crump, Maggie Gourville, Emily Hammond, Lucy Howard, Kelly Ledoux-Walsh, Bridget Rollins. Watertown: Keegan Duguay, Leah Strangio. Wilmington: Alex Bischoff, Julia Gake, Cassie Grasso, Kelly Hartsough. Winchester: Alexandra Curtin, Eleanor Ward. Woburn: Kaycie Burke, Gina D’Addario, Jenny Lee, Adrianna Manzi, Katie Murray. Old Colony — Barnstable: Amanda Henson. Bridgewater-Raynham: Catrina Burque, Molly DesRochers, Emma Frazier, Nicole Geragahty, Molly Page, Alicia Porter, Samantha Sherrick, Emma Sullivan. Dartmouth: Oriana Barthelmes, Skylar Barthelmes, Caitlyn Demers. Patriot — Hingham: Carly Baggott, Kate Criscitiello, Olivia Cundari, Isabella DiMare, Sarah Endyke, Leah Hickey, Sierra Irvin, Amy Kirk, Julia Noble, Morgan Sullivan. North Quincy: Emily Bryson, Julia Bryson. Pembroke: Anna Devitto, Katie Freitas, Jess Gratzer, Grace Kelly, Caroline Leung, Meghan Richards, Julieanne Watts. Scituate: Maria Garman, Phoebe Ryan. Whitman-Hanson: Sam Coletti, Kelsey Tierney. South Coast — Apponequet: Bethany McMeekin. Dighton-Rehoboth: Sam Rodrigues, Mia Rogers. Fairhaven: Kacie Carvalho, Bay Gammans, Emma Robidoux. Greater New Bedford: Neshaliz Elicier. Old Rochester: Samantha Barrett, Morgan DaSilva, Emily Josephson, Paige Santos, Zoey Smith. Seekonk: Erin Langlais, Nicole Mowry. Wareham: Emily Cummings, Johnny Irving, Kelley Peterson, Madison St. Julien. Tri-Valley — Ashland: Alyssa Zee. Holliston: Sydney Snow. Hopkinton: Shelby Aarden, Lauren Hazzard, Melissa Lodge, Jessica Scott. Medfield: Kristina Gustafson. Norton: Kassidy Campbell. Westwood: Phoebe Fitzgibbon, Callie Lupica, Maddie Radner, Michayla Young.